Have you ever read a book so good that you can’t stop talking about it, but no one gets it because they haven’t read the book? What if there was a group out there to help with this very issue? Well, contain your excitement because there is! It’s called Dear Readers and they meet in your neighborhood! Joining a book club will expand your vocabulary, broaden your horizons, & make you a better person. Need even more reasons to join? Keep reading! Make yourself read books outside of your comfort zone & stretch your brain. We alternate between fiction & nonfiction each month & try to pick fairly new books so you haven’t already read them. Meet your new friends. Show up a few minutes early to chat with others & enjoy a FREE glass of boxed wine or an ice cold fizzy water. Find a partner! You’re not going to meet this quality of potential life companion at a bar. Do a social thing that doesn’t involve a cover charge, shouting so that other people can hear you talk, or staying up past your bed time. Bask in the post-book-club-meeting glow of having participated in the magic that is a group of people in your community (who don’t all know each other!) getting together to have thoughtful conversation around a shared reading experience. ebook, audiobook or if you want to keep it local, grab an analog copy from Burke’s! 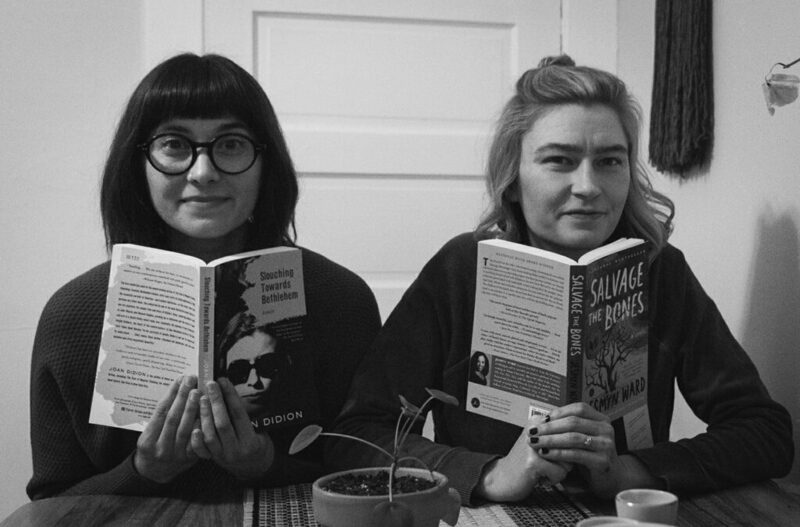 Kenzie and Tiffany meet with other book lovers once a month to discuss their book club pic. If you have any questions, email kenzie5000@gmail.com and calhountg@gmail.com.